Military intervention in The Gambia is "possible" if President Yahya Jammeh does not step down after having lost elections, the head of the West African regional bloc Ecowas has said. Diplomacy was the preferred path, but "draconian" measures would have to be considered if it failed, Marcel de Souza told France's RFI radio station. 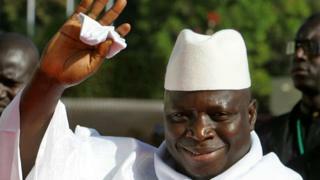 Four West African leaders are in The Gambia for crisis talks with Mr Jammeh. He initially accepted defeat to Adama Barrow, before changing his mind. Asked whether Ecowas would consider sending troops into The Gambia, Mr de Souza told Radio France Internationale: "We have done it in the past. We currently have troops in Guinea-Bissau with the Ecomib mission. We have had troops in Mali. And therefore it is a possible solution." The leaders of Nigeria, Ghana, Liberia and Sierra Leone all arrived earlier in the Gambian capital Banjul as part of a delegation to persuade President Jammeh to step down. Mr Barrow has welcomed the regional intervention, saying he hoped Mr Jammeh would give up power. The UN Security Council met on Monday and urged Mr Jammeh to meet international mediators. 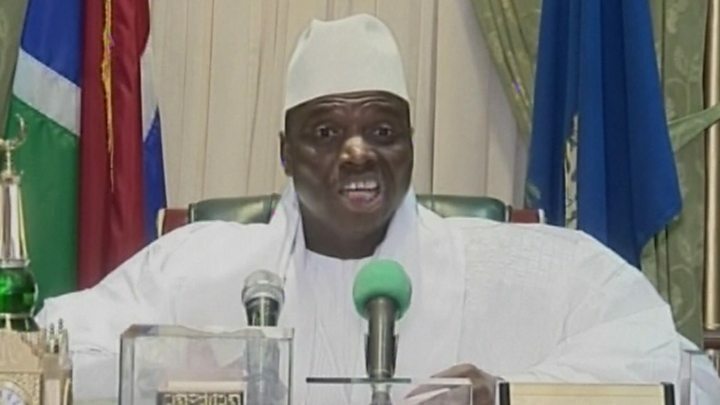 Mr Jammeh, who has ruled the country for 22 years, has questioned the validity of the count after the electoral commission changed some results, even though it insists the outcome was not affected. The commission said Mr Barrow obtained 222,708 votes (43.3%) compared with Mr Jammeh's 208,487 (39.6%). A third candidate, Mama Kandeh, won 89,768 votes (17.1%).